More San Diegans are leaving the car behind and jumping on their bikes to get around town. With that comes big concerns for cyclists' safety. 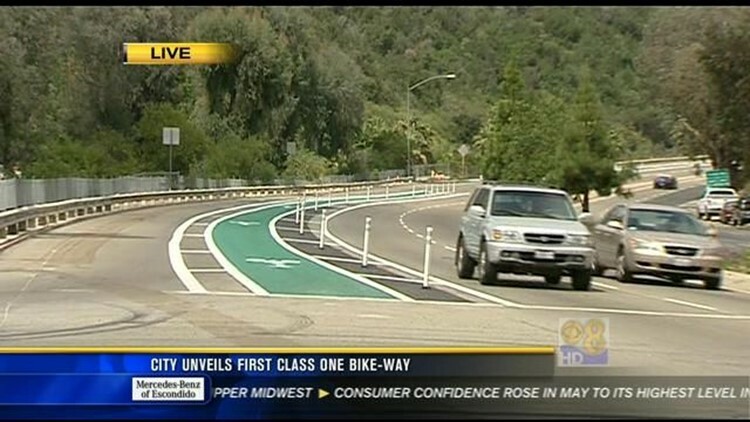 SAN DIEGO (CNS) - San Diegans have a new kind of bicycle lane in the College Area that city officials hope will reduce collisions on Montezuma Road. The lane, which starts at Montezuma Road and Collwood Lane, is painted green and separated from car lanes by a 2-3 foot buffer on both sides and, on the left, a series of vertical markers designed to alert drivers who veer into the bike lane. A turning lane for four-wheelers runs along the right side of the bike lane for drivers turning onto Collwood Boulevard. Samantha Ollinger of Bike SD told CBS 8 that a bike rider was killed near the intersection about a year ago. "The bike lane was extremely narrow," Ollinger said. "It was substandard condition. It was not at all inviting for people to ride in -- it was too scary, terrifying." The City Council two months ago passed a resolution that calls on San Diego officials to make bicycle safety a priority. Montezuma Road runs up a long slope toward San Diego State University, and cars usually go fast on the downhill side.